This is a bit of a tease. I can't share the recipe for these bagels, because the recipe is from a yet to be published book for which I'm one of the recipe testers. But they were so beautiful and so delicious, I just can't not at least share some photos. This is a real bagel! The crust is crisp. The crumb is very chewy. The flavor is delicious. What's not to like? Guaranteed to elicit comments from bagel cognoscenti (That's Italian for "mavens.") like, "I haven't had a bagel like this since .... " (with tears in their eyes). I apologize for not being able to share the recipe at this time. You'll just have to watch out for the book about New York Jewish bakeries and baking by Norm Berg and Stan Ginsburg when it's published. Those are so pretty, David, I'm tempted to twist the Hamelman bagels I'm making tonight, just for the fun of it. Temptation gets a bum rap! My considered advice is: Do it! When is it due to be published? Everything looks so delicious and the range of recipes is so unusual I will definitely buy this book. Please comment on your SFBI course as you learn & tell us how it changes your baking. Frankly, I don't even know if there is a target date. Before you ask, I don't know what it will be called either. I was back in London briefly and went to visit what used to be my favorite bagel place, the 24 hour shop in Ridley Road, Dalston. It was a disaster. 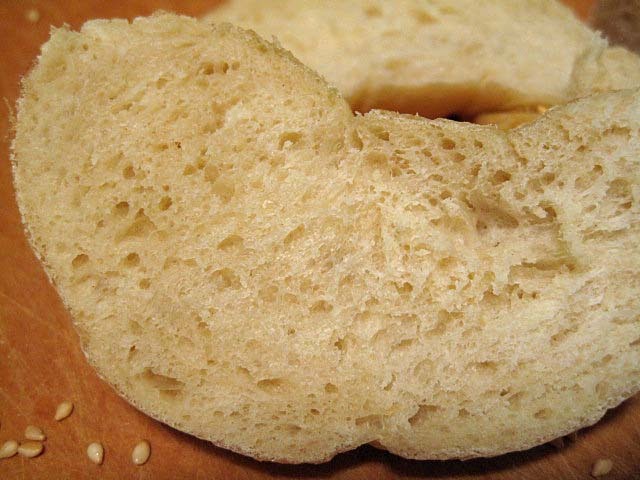 The bagels were now no more than soft bread rolls (a little like Bridge Rolls) with a hole in them. If I hadn't foregone my breakfast in favour of a bagel with cream cheese, I would have thrown it away. I took pictures, but hadn't thought of a review. 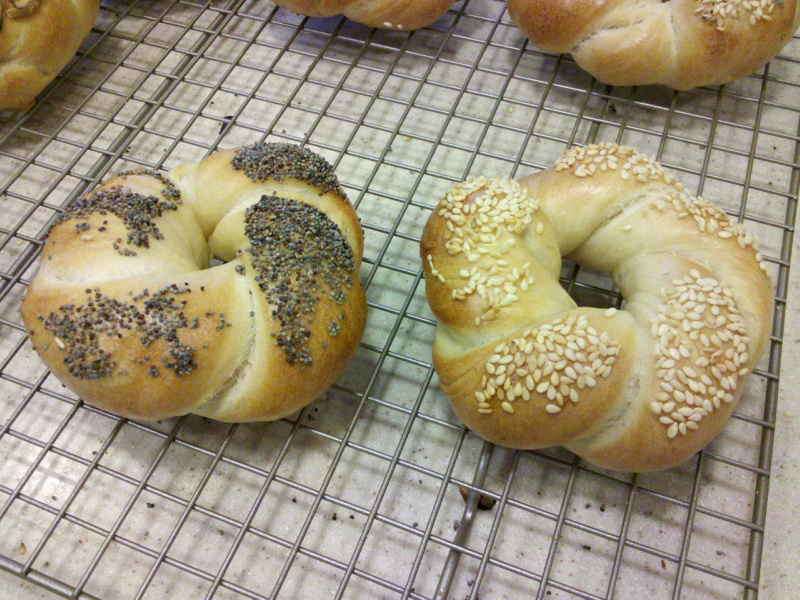 I have been making my own beigels, (rather than bagels) and they have been accepted very well. Reading your comments about all the places in London was like walking down memory lane My grandma shopped in Ridley Road and Daston. She lived in Stoke Newington and my memory of beigels were cakey, not doughey. I think it is all in the boiling, but am still new at this. I also make Challah. Havent tried platzels yet but you have all inspired me! Yes, I'm absolutely sure this is why I have never been enthused by bagels. David, your twisted bagels, like all your baking work, look amazing. Lindy's post, a while back, on Hamelman's bagels really got me thinking [see: http://www.thefreshloaf.com/node/17391/hamelman-bread-challenge-quintessential-bagel ] All I've ever come across are the apologies Daisy_A describes from those so uninspiring concession stands; although they should pay you to eat them, not the other way round. All the comments on vernacular food, instant gratification, and how good/bad it can be; some great comments. My tutor and mentor at Leeds harks back to the great bagel bakeries of Brick Lane. When they are that good, and the result is a long queue for them, that means they become almost made to order, such is the demand. Given no fat, and quite a tight dough, it strikes me bagels are not going to have the longest of shelf lives, even taking account of the gelatinisation in the boiling process. So if they are fresh out of the oven, as you queue, that it a major "wow" factor. Hanseata's posting on rye rolls using blue fenugreek, Joe V's turned up with Polish Rye, and David's got abot 6 threads going at the minute. 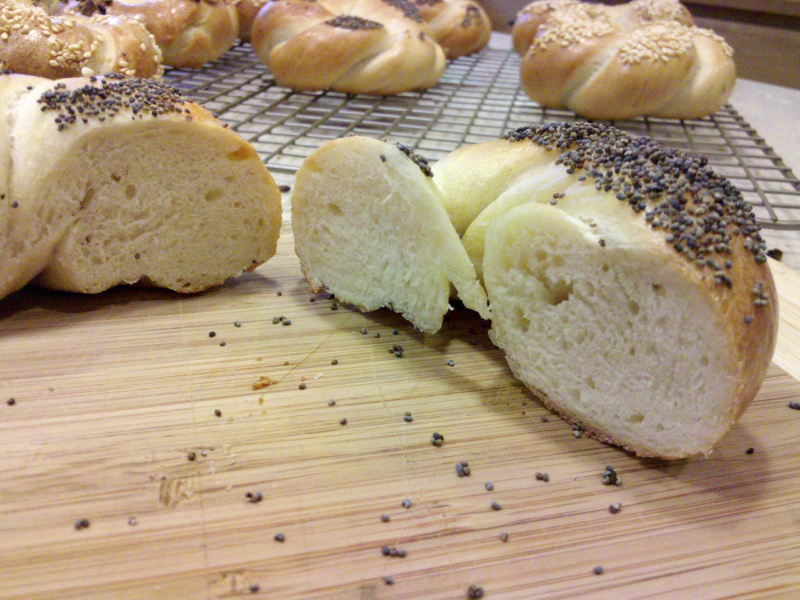 My update on the student breads is just up; truly cosmopolitan stuff going on. I'm sure I'll get to truly appreciate bagels pretty soon, but I'm of the same mindset about lye, Daisy_A. Definitely have no affinity with pretzels, although I know a good number of bakers on TFL really enjoy making them. The best bagels I've ever bought also staled the fastest. 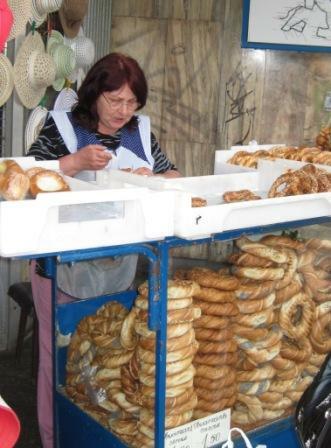 These Kraków Bagels do re-heat well the next day. I froze the ones I didn't eat or gift immediately right after they cooled. 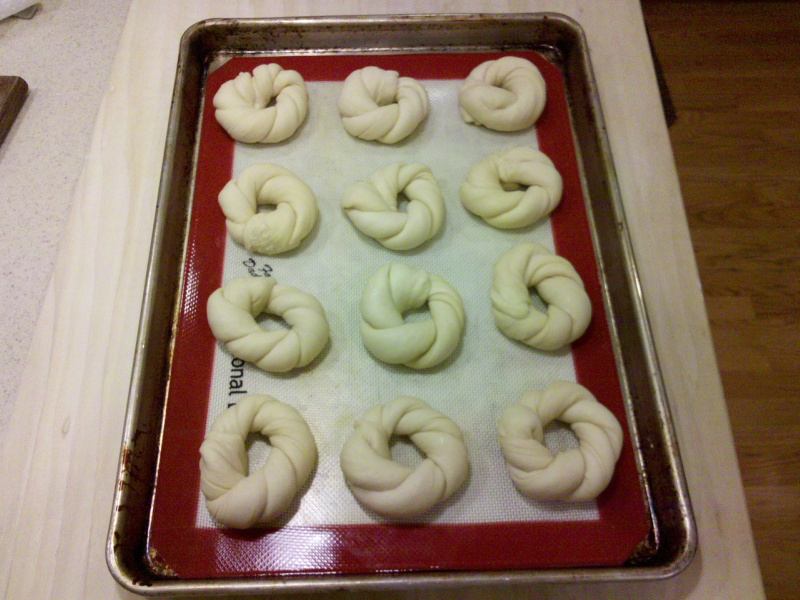 They won't be as good as right out of the oven, but will be better than day old. I pity anyone who has only had the soft, bready version that seems to predominate today. A "real" bagel is a treat. Like a good baguette, they don't really need anything on them to be enjoyable. I recall as a child that my favorite way to eat bagels was right out of the bag, on the way home from the bakery when the crust was still crisp. 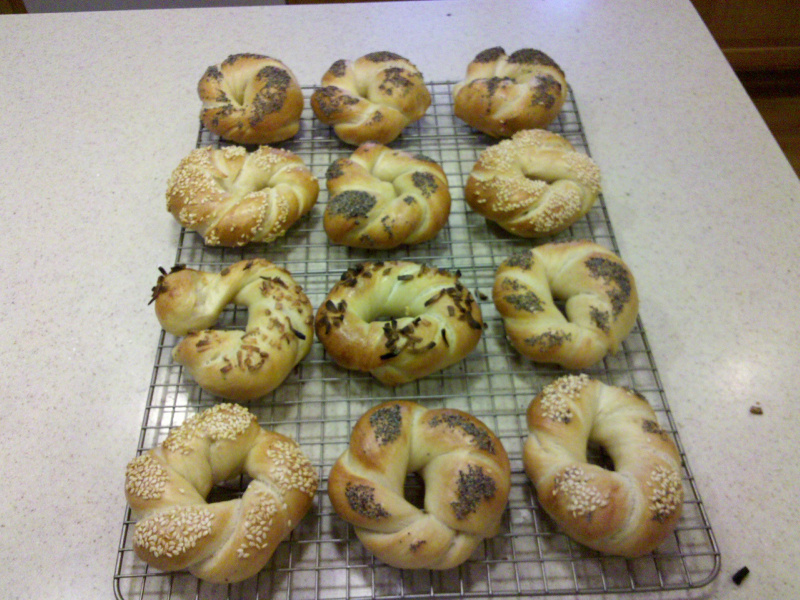 I have yet to make sourdough bagels, but they are on my "to bake list." I expect they will stale more slowly, like other breads made with levain. Wonderful photos! Thanks for sharing them. The bagels in the photo are considerably larger than mine, not to mention thinner and more symmetrical. I now have a target to shoot for, which helps. I am crying over your bagels! I am looking at your bagels and I felt like crying! I live in a small town and the only bagels we have are the one in the frozen case or the one that Kroger or Food lion rebake from their frozen supply. The only great bagels that I had was ten years ago( Einstein Bagels) in Fl. As usual David, you have created a Masterpiece. Thanks for sharing. 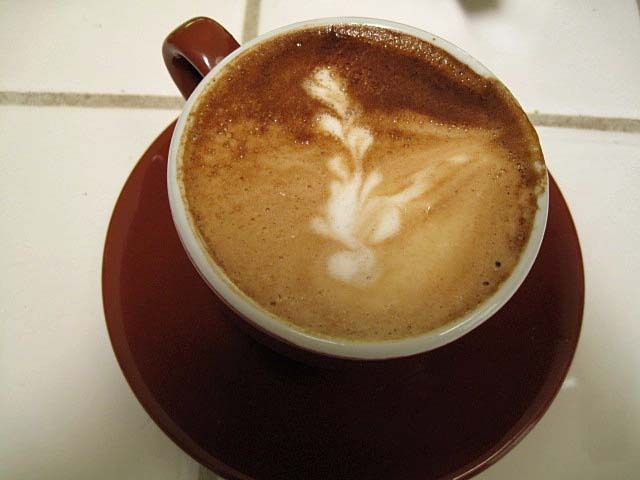 I am so.............hungry for the bagels and a good cup of coffee! Sometime it is a curse to live in a small town. Bagels are really quite easy to make, and what you make at home is going to be superior to those you can buy almost anywhere. As I said, i cannot yet share the recipe for these, but the ones in BBA are good. The ones in Hamelman's "Bread" have gotten very positive reviews. There are lots of bagel recipes posted on TFL. I'd encourage you to make your own. mine came out great also but not as beautiful as yours. i need to work on my shaping. however, my husband loves the bagels. Definitely delicious bagels, but the shaping is a bit of a challenge. I'll be making these again, and I bet the shaping will get easier with practice. 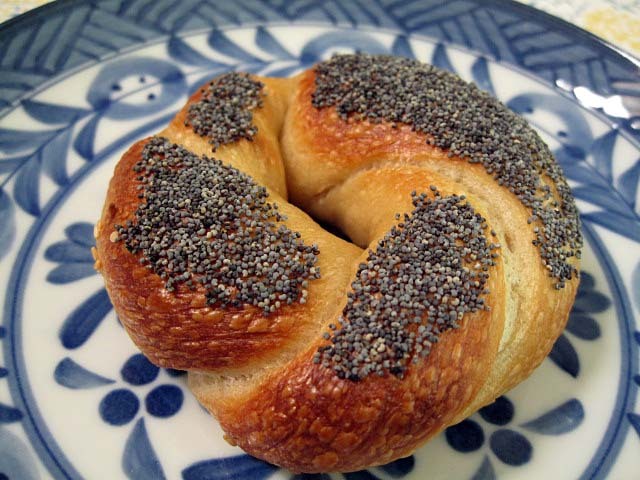 did you sprinkle the sesame & poppy seed on you bagels or did you dip them? your toppings look much better than mine. i'll also make these again. yes, i saw the photo. i thought those were your bagels after you baked them. The seeds were not "sprinkled." 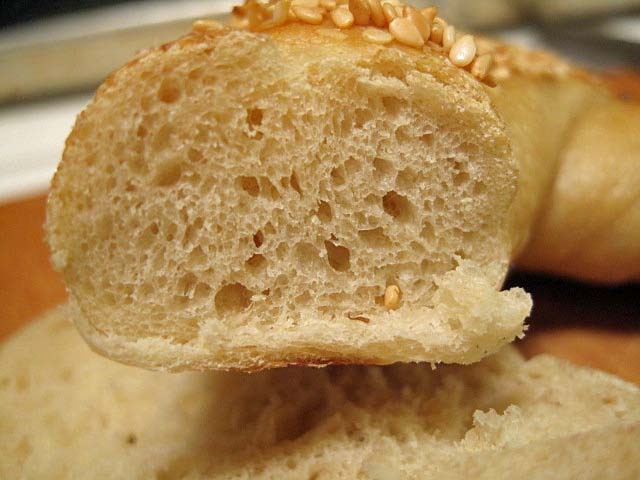 The bagels were pressed into beds of seeds in pie plates right after boiling. This is the way the pros do, and it works. 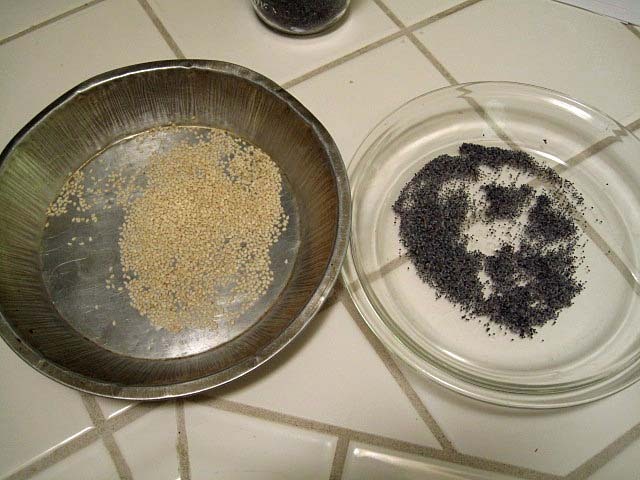 There is a photo of the seeds in pie plates in the original post in this entry. My very favourite bagels are twister bagels from Bagel World in Toronto. These look so much like them. I wonder if they taste the same? From your description, (crisp crust, chewy crumb) they sound very similar! I will look for the book when it comes out. Your work is beautiful!! Thanks for posting. Thanks for the link, dcsuhocki! The photos were great. I wish there was a video of the bagel shaping. The bagels look really wonderful! I can only say it's great fun to be a tester for NYB - I'm in the pastry group and glad I jumped at the occasion. I'm having a ball with the testing! I have one more bread recipe coming, then the groups rotate, as I understand the plan. I have a lot less experience with pastries and cookies, so I expect to learn a lot from having those to bake. I've "contracted" with some neighbors to assist with the eating, so the calories get divided among more people. Just saw those gorgeous bagels. I've been dragging my heels re. bagel-baking, but now I'm inspired! (I had an uncle who was a bagel-baker in New York, so it's got to be a family tradition, too!) And your photographs are incredible! We've been buying Costco's (Noah's) bagels for years, but Noah's has changed hands and now those bagels are much too soft and bready like most of them on the market. The time has come! 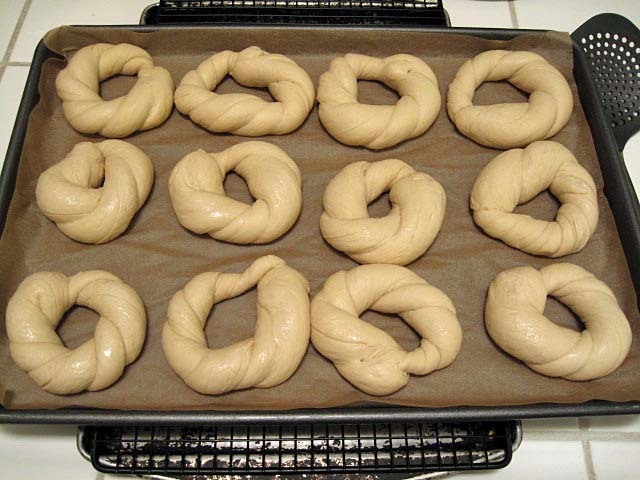 I haven't made bagels often, but now that I have Norm's recipe, I will make them more often. I haven't made the Hamelman bagels than many have extolled, but I've been skeptical since he doesn't do the usual overnight retardation. Norm's are about perfect. I'll be making more this weekend. all the bagel formulas are mine (it took me almost a year to perfect that water bagel dough), as well as all the challahs, all the ryes (except for the corn rye) and the bialys. Norm contributed all the rolls, cakes, cookies and sweet yeast pastry formulas -- along with lots and lots of technical expertise, ingredient knowledge, reminiscences and know-how. the book's a real collaborative effort between a couple of New York Jews who love baking! Well, then, my thanks to you, Stan! 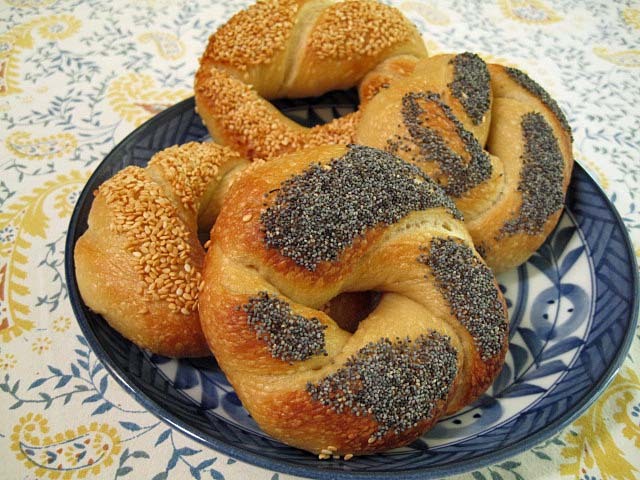 I only got the Krakow Bagel recipe, as you know, having sent it, but it is wonderful! The challah was more spectacular, but will be reserved for special occasions ... like successful weight loss celebrations. ;-) The bagels are likely to get into my regular baking routine. it's something like having your kid win a prize and then the presenter gives all the credit to the step-dad ... and thanks. it gives both Norm and me tremendous pleasure and satisfaction to know that (a) the formulas are translating well into home kitchens and (b) knowledgeable bakers are loving them (mostly). thanks for allowing me to test this recipe. it is the best bagel recipe ever. I am happy to be a tester-any time! Oh yes, David, forgot to mention I just baked my first babka (just saw your comment). Peter Reinhart has a great way of handling the chocolate-cinnamon filling in his new book--freeze the chocolate, keep the butter cold and process in the food processor. And lots of chocolate (my kids complained there wasn't enough)! Also, poking some holes w/ a toothpick on top of the loaf before baking helped keep the air pockets to a minimum. Boy oh boy! I liked babka the few times I have had it from bakeries. I made it once from Maggie Glezer's recipe. The dough was delicious, but the filling was too sweet for me. 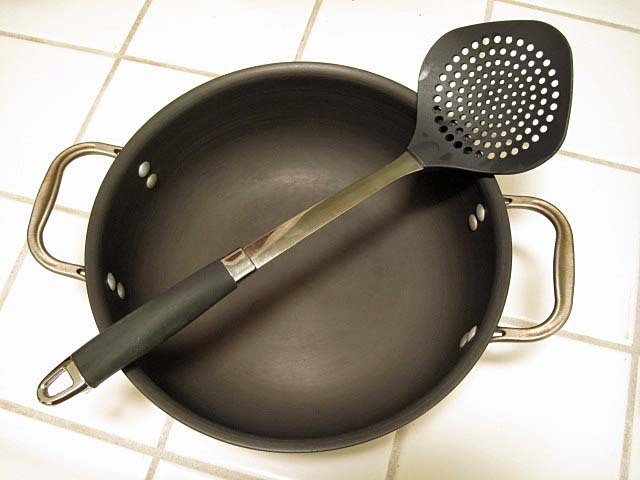 I'm waiting to see if I get Norm's recipe when I rotate to that group. I'm hoping so. Is the purpose of Reinhart keeping the butter cold to make a flakier pastry? Those look extremely worthy! I'll be happy to taste test them! I have not had a REALLY GOOD bagel since leaving New England. They are kinda..uhh...umm..they're edible, but I choose not to. Saving my calories for the real deal. We spent an awesome weekend in Ashland OR at the Shakespeare Festival..not seeing any of Will's stuff. Pride and Prejudice and Cat on a Hot Tin Roof. So my assigned Egg Bagels are on the agenda for this Friday, my day off. I aspire to match your bake! Longing for some summer tomatoes to enjoy with some lox, cream cheese and red onion..Dang David! These were fantastic bagels, but I see from the photos from Kraków that I didn't shape them quite correctly. DavidG's were closer to the real shape. Have fun with the egg bagels. I'm looking forward to seeing them. David, the cold butter plus the frozen chocolate allows one to put it in the processor without it getting gummy; it spreads easily on the rolled out dough. I found the recipe here: www.notderbypie.com/chocolate-babka/. I used T.J.'s "pound plus" 53% cocoa solids, 8 oz., chopped, 1/4 c. cold butter, sliced, 2 TBSP sugar (could be omitted as chocolate is sweet), pinch salt. I did make the streusel (half the amount in the recipe) and used egg white only for the egg wash. The dough is like a brioche dough. I used 2 whole eggs and 1 yolk (not the 4 yolks in the recipe--every little bit helps!). Also, per instructions in Baking With Julie for basic brioche dough, I refrigerated the dough overnight; it's very sticky and hard to handle when first mixed. I really couldn't knead it by hand very well; didn't want to add too much flour. I tried kneading on a Silpat. I baked one half of the recipe in an 8 x 4 loaf pan. The other half I made free form like a Kranz cake: split the rolled dough in half lengthwise, twisted the two halves (from middle outward to both ends). It spread out a lot, so next time I'll fit it into a tube pan. Forgot to mention that I combined Peter Reinhart's (adapted by "notderbypie") recipe for the filling and streusel (again, made half of the streusel) with the Epicurious recipe for the dough. I do that a lot, research 2, 3 or even 4 recipes for an item and then mix 'em up. Usually that works. I had checked Reinhart's new book out of the library but didn't copy the babka recipe; so I resorted to "notderbypie." Obviously, I decided not to buy his book. Maybe some other time . . . These look almost exactly as I had seen them in Krakov. I wonder when the book is out? If this is an example of the quality of recipe, I will buy it! Your bagels look great. I made a batch of twisted bagels after reading your post. My bagels didn't have the same definition as yours. Can you share with me how you twisted your bagels? I enjoyed reading one of your blogs from the SFBI course, It sounds like a great course that I would like to take someday. I've been baking for about a year, with very good results. I've read a few reviews about Advanced Bread and Pastry. Would you recommend this book for a beginner baker? That's the shaping method. Hope this helps. Re. AB&P: It's .... errrr ... "advanced." I don't think it's a best first book for an absolute beginner. Even Hamelman's "Bread," which is also aimed at professionals, is more accessible to the beginner. "The Bread Baker's Apprentice" is still my first choice as a first choice for the serious beginning bread baker. The double strand makes sense. I'll let you know how they come out. Thanks for the advice on the bagels and the book. Thanks for the instructions, they look great! This was my test batch before I make 2 dozen for brunch with my family this weekend. I discovered after I'd made them that the twisting should be tighter. 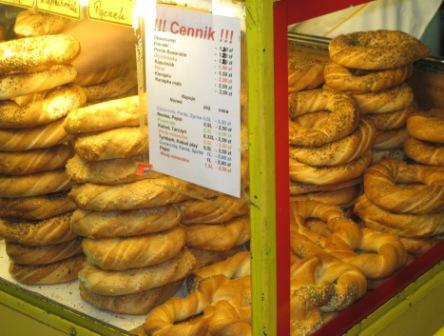 See the photo above of these bagels from Krakow. Hmmm .... Time to make them again myself, I'm thinking.